Join us for this series of fun courses and learn how to make your own beauty products at home, using natural ingredients that are good for your body and the environment. We add new courses several time a year; check our current course offerings at the start of every semester to see what’s new. For most courses, the course fee already includes supply costs for all materials and ingredients you will need. You get to take home the beauty products you make in class, along with recipes to make more batches at home. Organic unrefined beeswax is the foundation for many nourishing body care products. The amazing wax actually locks in moisture, allowing skin to breathe. Not only does beeswax keep us moisturized, but it also will keep skin protected from the harsh environment. Beeswax also works as a skin softener, and nourishes our skin too. In this class, make and take home a healthy lip balm, an herbal salve, a honey & papaya facial mask, a lotion bar and a beeswax aromatherapy votive candle. You will also receive recipes on furniture polish and owie balm. ALL SUPPLIES INCLUDED IN COURSE FEE. Beer – the great skin conditioner! From pre-blended vegan bases, learn the basics of creating beer soap. Previous knowledge of cold process soap making is NOT necessary. Using a stout beer, create a cedarwood and lemon bar. Explore different ingredients, methods and techniques that you can use to create exciting soaps. Learn about history, trouble-shooting, decorating and packaging your soaps! Also receive a finished soap bar. Please bring hand towel to class. Come to class scent free and bring an apron (or wear appropriate clothing). ALL SUPPLIES INCLUDED IN COURSE FEE. Essential oils are a popular alternative therapy. 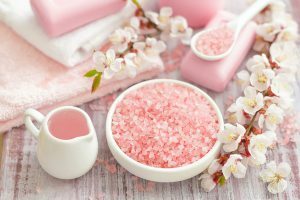 Aromatherapy is a gentle treatment that can be used as an addition and sometimes an alternative to many conventional medications. The world of aromatherapy can assist in a range of conditions: promote hair growth, alleviate severe back pain and inflammation, clarify the mind, help with menstrual cramps, encourage memory, or simply help center and relax before the day. In this hands-on class, create a blend for your personal ailment (pain / scarring / lymphatic drainage / snoring / insomnia / muscle spasms), a healing salve, a personal roll-on blend (relax / enliven / sensual / pain relief) and a essential oils spray (custom created). Plus discussion on properties of the therapeutic oils and recipes for body sprays and lip balms. For you or your Valentine! Create luxurious and high-quality products using organic cacao, nourishing butters, organic oils and botanical extracts without the high cost. In this class, learn about the powerful antioxidant properties of chocolate. Make and take home a chocolate body butter (with optional shimmer or tint), cocoa body scrub (for gentle exfoliation leaving your skin feeling silky smooth), a variety of tub truffles in various scents and shapes, and a chocolate moisture lip treat. Plus a Valentine body care gift for each participant! Also receive recipes on body sprays and tub treats. Making your own moisturizing creams and lotions is simple, fun and affordable! The beauty of making your own products is the knowing exactly what ingredients are being used and combining them in recipes that address your skin type and/or skin problem. In this fun and informative class, make and take home a vitamin-packed cream, an aloe vera moisturizer, a rejuvenating facial oil and an herbal shampoo. Bonus: bronzing micas can be added to your lotion for a sun kissed look! Plus recipes for masks and gentle facial scrubs. ALL SUPPLIES INCLUDED IN COURSE FEE. Soap from scratch for everyone! Make a long lasting herbal floral soap recipe and a batch of citrus explosion soap. Explore different ingredients, methods and various techniques that you can use to create exciting soaps. Learn about trouble-shooting, history and packaging/decorating your soaps. Plus handmilled soaps with vegetable-based soap blocks, herbs, spices and essential oils. Make a deodorizing pet soap, floral soap balls, citrus dish soap, and a close shave herbal soap. PLUS receive samples of Dishwasher Tablets along with the recipe too. Recipes for gentle baby bars, laundry soap, herbal shampoo, rope soap, and a gardener’s bar. Please bring hand towel to class.